Maybe part of the appeal for me of the McRae Wood Shiraz from the Clare Valley is its flaunting of slightly kitsch shortbread-tin Scottishness. From the silhouetted kilted sheep farmer on the label, to the dinky tartan neck collar which gives these bottles a cuddly, Scottie-dog friendliness. But like one or two real Scotties of my acquaintance, this wine has real bite too with 15.5% alcohol. 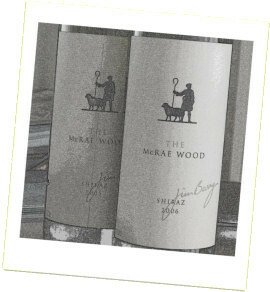 In fact the wine’s name and label pay homage to Duncan McRae Wood, a sheep farmer from whom Jim Barry purchased 70 acres of prime land in 1964 to plant his first Shiraz vineyard. This is classic South Australian stuff, showing massive ripeness and the vanilla and spices of ageing in American oak. But as well as the concentration, fruit and abundant richness of the wine, it is so well handled with balance tannins and acidity and the structure to age for a decade. The 2005 is still deep, but has an evolving colour with some softening reddish tones on the rim and a darker core. On the nose there is a sweet gaminess, a little animal overlay to wonderfully rich and spicy depths of fruit. The oak is mellow and polished, the fruit showing a touch of mint, but mulled and rich. On the palate this has quite an impact: it a deep, powerful wine of course with its 15.5% ABV, and the tannins have plenty of grainy, grippy presence. Despite the ripeness it is anything but jammy, the depth and spice of the fruit and oak and solidity of the tannins see to that, with enough acidity to give it an edge. 91/100. £22.95, Winedirect.co.uk, but see all stockists on wine-searcher. Again there is a hefty 15.5% ABV here, though the nose seems a little purer, a little more peppery too, focused on lean and sinewy black berry fruit, a layer of cocoa and a whisper of exotic, almost floral top notes adds lovely complexity. On the palate this is firm, taut, with a fine depth of blackcurrant and some red fruit tones, and those spicy and peppery edges again. The tannins seem a little finer, though still grippy, and this has an air of precision that is just missing on the otherwise impressive 2005. Indeed the 2005 is the more highly regarded vintage, but based on the evidence of these two bottles, the 2006 get the nod from me. 93/100. £21.50, Hennings Wine Merchants, but see all stockists on wine-searcher.